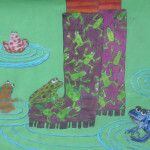 In the Spring of 2009, when Frogs Are Green was just an idea, I had a dream, and that dream is coming true. My dream is to do all that I can to bring awareness within my community and around the world to help save frogs and amphibians. This coming Tuesday, April 22, is Earth Day and we’re having the first of two celebrations, here in Jersey City! 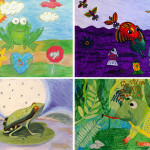 The Distillery Gallery and Artspace has partnered with Frogs Are Green to showcase hundreds of artworks by children 3-12 from more than 27 countries. Green Dream International Children’s Earth Day Exhibition is on display April 5-27 and visitors are streaming in, either as they pass by or riding over on their bicycles. On the 22nd of April, join us between 7-10 pm for a little wine and food with our musical guests, The Sensational Country Blues Wonders. 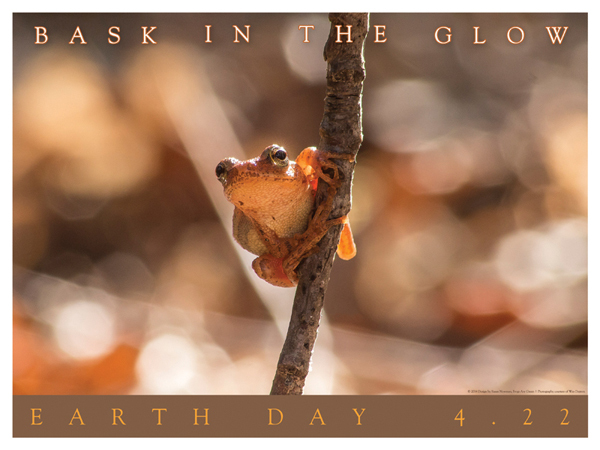 Saturday, April 26th, is Save the Frogs Day and this will be the first big STF Day event we’ve coordinated here in Jersey City. Join us from 4-7 pm with musical guests, The Gully Hubbards, as well as guest speakers: Mayor Steven Fulop, Laura Skolar of the Jersey City Parks Coalition, and Michelle Anne Luebke, instructor at CUNY and environmentalist. Chef Camillo Sabella is bringing his delicious gluten-free, vegan, organic treats and Gia Gelato is bringing her yummy gelato! I have connected with Jersey City in a multitude of new ways. Last week, I spoke at The Village Community Association, which is a section of downtown Jersey City, and this past week I spoke to the Pershing Field Garden Friends (in my own neighborhood), and enjoyed hearing about what both groups are doing! I have also connected with the visual coordinator for Jersey City public schools as well as teachers at the Learning Community Charter School where they study frogs and amphibians as a part of their curriculum. 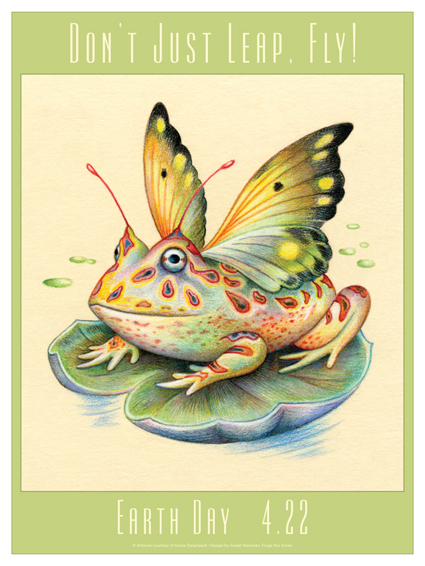 Each time someone asks “What’s happening to the frogs?” I know my work has just begun. Talking with different people from these different groups has given me ideas of ways to build even more awareness in the coming months and years. I’ll be looking to bring the Green Dream to other cities, schools and galleries as a traveling exhibit. 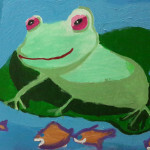 The 2014 Frogs Are Green children’s art contest as well as the photography contests (Frogs in the Wild and Backyard Frogs, which are open to frog lovers of all ages), will open September 2, 2014 and I expect Jersey City to lead the USA as the largest contributor of artwork and make us all proud. Happy Earth Day and Save The Frogs Day, to all. 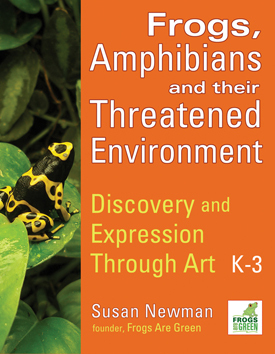 This entry was posted in A-Z Frogs, Children and Nature, Climate change and frogs, Contests, Earth Day, frog exhibits, Frog People, Frog posters, Frogs Are Green contests, Frogs Are Green kids' art contest, Frogs Are Green Photo Contests, Green Dream, How You Can Help, Kids Art Contest, Learn about Frogs, People Helping Frogs and Toads, Photographing Frogs and Toads, Save the Frogs Day, Teaching Kids about Frogs and tagged chef camillo sabella, City of Jersey City, creative kids, distillery gallery, distillery gallery jersey city, Earth Day 2014, earth day event, frog artwork, Frogs Are Green kids' art contest, gia gelato, green dream, green dream art exhibition, green dream jersey city, jersey city gallery, Jersey City Parks Coalition, Mayor Steven Fulop, Pershing Field Garden Friends, save the frogs day event, Sensational Country Blues Wonders, the gully hubbards, The Village Jersey City. Bookmark the permalink.